The first fighter to step into the octagon this evening was Kane Farmer from the Republic of Ireland making his Clash of Warriors debut. His opponent was local boy Luke Brown who was representing Tap or Snap in Mansfield. Although both evenly matched in terms of weight, Luke had a slight height advantage over his opponent. Kane wasted no time at all, quickly getting in a number of body kicks. Luke wasted no time responding to this attack and seconds later had his opponent pinned down to the ground. Both fighters seemed to be holding their positions for some time until Luke managed to get into an advantageous position. Once in position he delivered a barrage of punches to the head which forced the referee to step in and stop the fight. 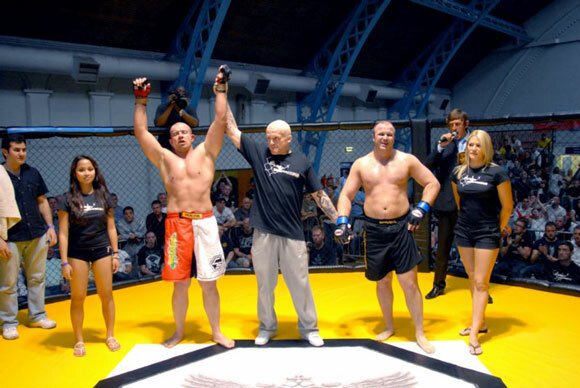 Luke was announced the winner by method of Ground and Pound. 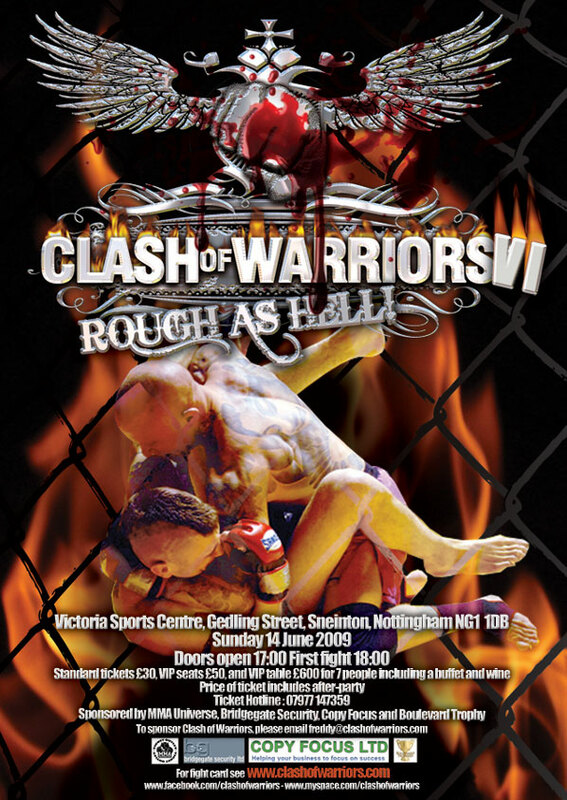 Another fight between a local Nottingham fighter and a new face from overseas. Arunas Siatus from Lithuania was representing Antonio’s Gym and making his MMA debut tonight. 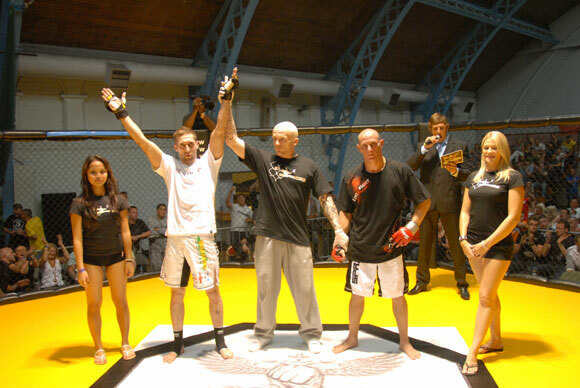 John Gregg was also making his MMA debut and has plenty of local support from the audience. The two seemed to be evenly matched in both weight and height but there was an age gap of almost 10 years between these two. When the round started both fighters appeared to begin cautiously with both defending well as they each tried to block the others punches. However while trying to swerve out of the way of an attack Arunas appeared to lose his sure footing for a second and John made the most of it. 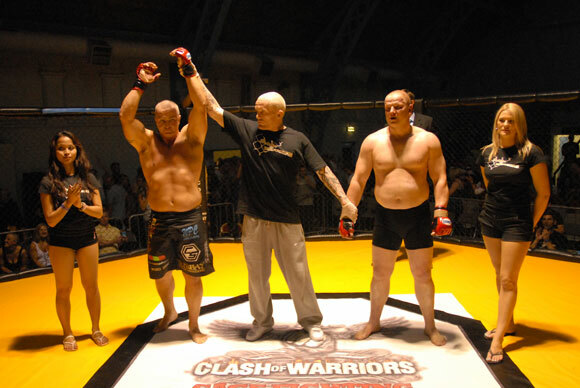 After getting him pinned down on the cage floor John delivered a series of punches and once again the referee had to step in to end the fight. John Gregg was declared the winner by method of Ground and Pound. 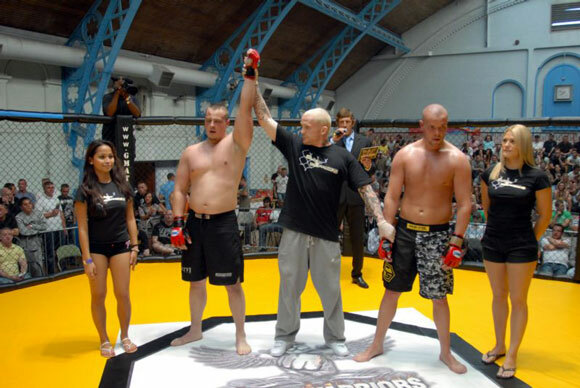 Artur Kus from K-STAR in Poland stepped into the ring with a record of 2 wins under his belt and 0 defeats. His opponent Avi Jack had perhaps and even more impressive record of 5 wins and 1 defeat. Avi got in a punch straight away and although both fighters wanted to continue it soon became clear that the punch may have done some serious damage. The paramedics were called in to check on a Arthur when the blood started to pour from his. After being cleared up both fighters were raring to carry on. Arthur managed to land a convincing kick but both fighters were playing it cautiously with neither quite managing to land the killer blow. On the stroke of 4 minutes Arthur had Avi pinned up against the cage. However Avi was able to turn this around and managed to get his opponent pinned to the floor. Despite a few blows from each, neither could break the stalemate – end of round 1. As we go into round 2, both fighters are keeping their hands up and defending well. Once again Arthur has Avi pinned up against the cage, but only for a few seconds. He manages to get free and despite a few kicks from both they manage to keep each other at bay. There’s a scramble as Avi goes for the take-down. It looks like Arthur may have sustained another injury as he appears to be bleeding from the head once again. Avi has him pinned down to the floor and refuses to give him a chance to get up. Avi delivers a number of punches to the head but Arthur takes it. Avi keeps him pinned down but no really delivering any more blows at this point. Avi clearly dominated much more in the second round. With both fighters appearing to have dominated a round each, it came as no surprise when the judges unanimously declared the fight a draw. Both fighters had plenty of support from the crowd however this time the support for the local boy just wasn’t enough. 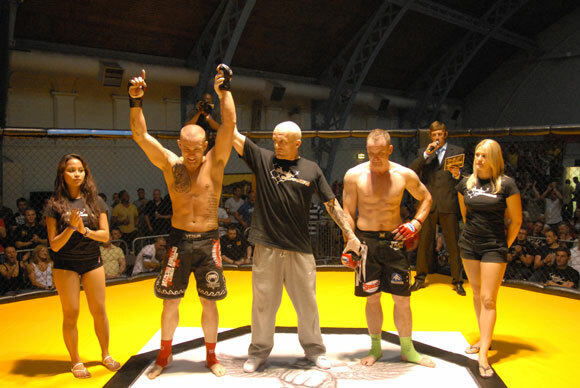 Both fighters started aggressively and Steve quickly had the upper hand getting his opponent pinned down early on. 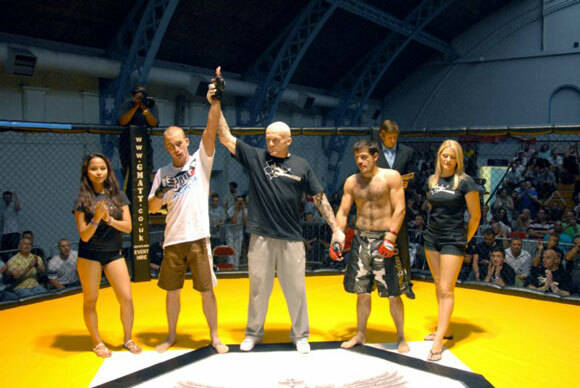 Using a Rear naked choke, this fight was over after only 27 seconds. Another case of both fighters making their MMA debut’s tonight. Radoslaw started aggressively getting a number of body and head punches in early on, which he followed up by getting Jason pinned down. Jason successfully managed to get back to his feet very quickly but Radoslaw seems to be dominating so far. Back on their feet the fight proceeds a bit more cautiously. Both doing a good job keeping their hands up to protect themselves and each biding their time. Once again Radoslow gains the advantage and gets his opponent pinned down however does not deliver any more blows before the end of the round. As we enter round 2 both fighters are starting to look tired. Radoslaw almost seems to be taunting his opponent however Jason comes out of nowhere with a great attack and has him pinned up against the cage. Radsolaw manages to evade and turns the tables getting Jason pinned to the floor. Jason tries to withstand it but its only a matter of time and in the end he taps out. 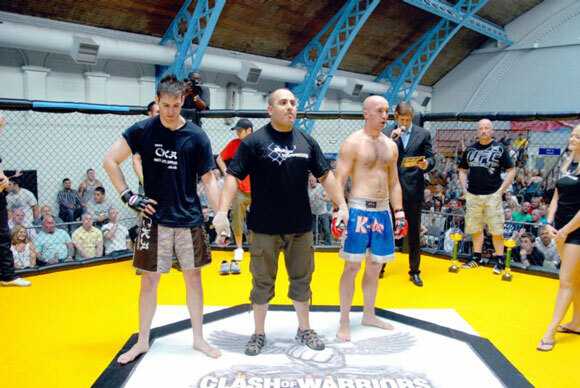 Making his MMA debut, Tony has a slight height advantage over Piotr but apart from that they seem evenly matched. As expected Tony makes the most of his height and straight away gets in a high and convincing kick. Piotr defends well and after a slight scramble between the two, Tony has his opponent pinned up against the cage. Tony delivers a number of body shots that Piotr can only take for so long. An excellent debut performance from Tony Moran. Two regulars this time. Tommy Mullin has brought plenty of fans from Manchester as always and David “The Destroyer” Cieplicki has many of the locals in the audience behind him. Neither want to let down their supporters. Both fighters get off to an explosive start with both delivering blows to the head. Tommy seems to have the upper hand at first, quickly getting David pinned down on the floor. Both delivering body punches, for a second it seems David can get out of it but Tommy has no intention of letting him. Locked in an apparent stalemate at this point, the pace appears to be slowing down as both fighters count down the seconds until the end of the round. As we enter round 2, both fighters are starting to look tired. After a cautious start David goes on the offensive and after a barrage of punches has Tommy pinned down to the floor. The crowd go wild as he proceeds to deliver a barrage of punches to the head. The ref has to step in and David is named the winner by means of Ground and Pound. 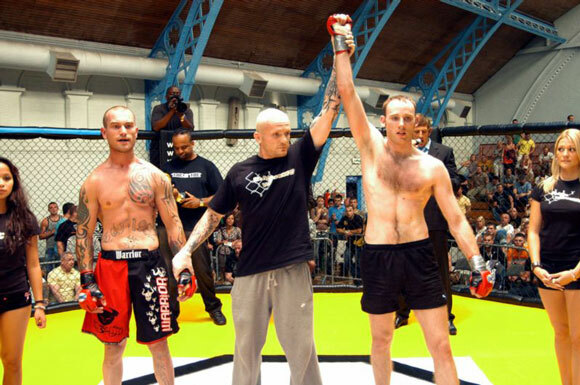 Another popular local fighter, Karsten definitely had the crowd on his side. He started off well getting an early kick in but Chris responds well and manages to get him pinned against the cage. As they are heading to the floor, Karsten recovers brilliantly and manages to get into a better position. However following a scramble on the floor Chris is now on top and dictating the pin down. He delivers a number of head and body shots. Karsten is able to withstand it and in another fantastic move he manages to get himself back on top and starts piling on the punches. With the crowd cheering him on he continues until the ref is forced to step in and end the fight. The looks on Karsten’s face shows just how delighted he is. Once again we have a local fighter from Nottingham against a new face from abroad. The fight gets off to a good start with both fighters managing to make contact with both kicks and punches. In a brilliant move Pete gets Rafikas on the ground and goes in for the kill. Delivering a barrage of punches to the head, after 57 seconds of round 1 the referee steps in again and ends the fight. Neil gets off to an aggressive start quickly pinning Paul to the cage. He then proceeds to pick him up and carry him across the cage where he drops him to the floor. Whilst pinned down to the floor he delivers and barrage of body shots and after 1.13 mins of round 1 Neil is declared the winner by means of Kimura Arm lock. The fight they have all been waiting for tonight. Right from the start Wayne looks to be more dominating in the cage. Regimantas tries a series of punches but none of them can connect and Wayne responds by almost throwing him into the side of the cage. However Regimantas has no intention of giving up and keeps coming. Both attempt a few body kicks then Wayne delivers a head punch that sends Regimantas back against the cage wall – once again he manages to recover quickly. Since the start Regimantas does not look that steady on his feet. It looks like Wayne has noticed this and after a well calculated duck, Wayne has got his opponent pinned down to the floor. A barrage of punches follows with Regimantas manoeuvring himself onto his front in an effort to protect himself. However the punches keep coming and in the end the referee steps in and ends the fight. Wayne is declared the winner by means of ground and pound.